Last night I dream't there was water pouring through the electrics. The house was on fire, caused by the boiler. I was trying to open the locked doors to let the mouse out, yes the very same one that's nibbled through my phone cable! I was furious with my son who wouldn't leave his room even though the house was full of smoke. I was trying to throw the electric switch so we wouldn't be electrocuted. I woke up in the early hours. Always a good time for imagining the worst. Do you do this? Responsibilities build up. The house will surely fall down if I can't hold it up, myself. So, the boiler needs servicing, I think the roof has a leak. I need to call the electrician about my light switch. The phone engineer is supposed to be coming right now. I saw the mouse last night, having a stroll around. Only humane traps here. I think he likes here, he gets to eat all the bits of veg I drop. I mean why bother going in the trap! Even the dog watches him. I think she thinks he's a pet. But this time it feels like a call to action. a new display on my mantle, still needs a bit more colour I think. At home I have been pottering around in the process of re-discovering lost treasures. Opening things up. Cleaning them, shifting things around. Redefining who we are now and how we live. 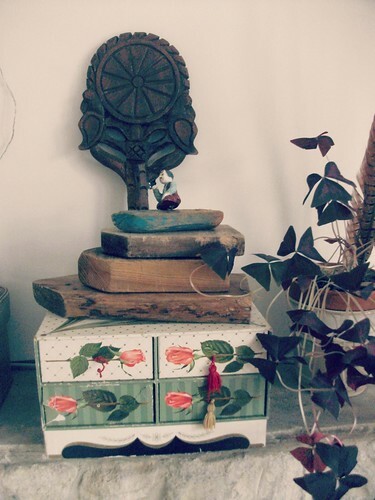 A new (old) suitcase has been found, together with another vintage chocolate box. I have a little collection of these, I must show you. Please ignore the cable in the background, who put that there! wooden plank boats and a hand mirror which belonged to my Mum. I remember the sanding and making of these little boats and the sailing adventures they went on in the bath! In my craft room, a few things are waiting for the moment to strike. I love these little cards. I have a whole box of them. I've opened the box up over the years and peered inside, now I have some ideas of what to do with them. One things for sure Tetley tea and Wills cigarettes were a staple at my grandparents house! 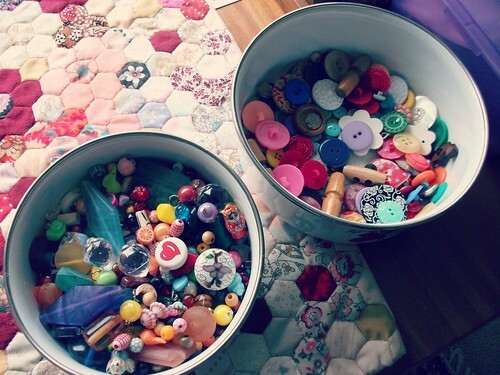 I've put my buttons and beads where I can see them. I emptied some strands of beads into the pot. We are never to old for beads! Love these. 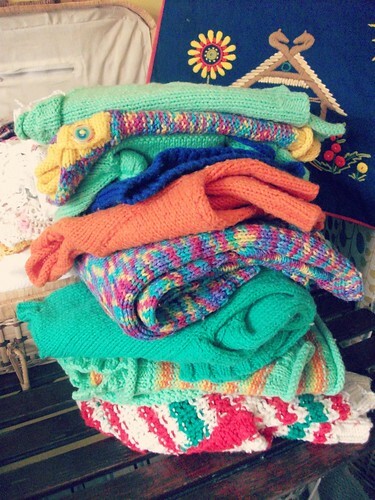 In the corner sits a little colourfull pile of handmade children's jumpers, made my Mum. I can't bring myself to part with these. I've given them a wash, it was so nice to see them out drying. Just like yesterday! 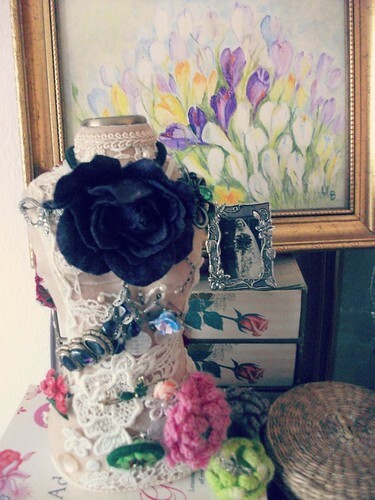 On my dresser I have made a little arrangement of all my brooches pinned onto a small mannequin which no longer has it's stand. It's nice to be able to see them and not have them hidden away in boxes. A little picture of my Dad's Mum on her wedding day. You can see another vintage chocolate box in the background and the picture of the crocuses I adore. The velvet flower was given to me years ago by my Mum, I think it goes well there. I have made a fabric covered jewellery board and hung some things that would normally be tucked away in draws. I've polished and shined, silver polish makes a huge difference. I feel like I polished a small part of soul, bringing things back to their former shine is very satisfying. I'll let you know more about the board in my next post. I went to see an old friend, just for the day. To catch up and help remember the parts we had forgotten. It was so nice. So much time has flown by since our days of hanging out, traveling and partying! Life has changed a lot. But it's still us somewhere. A deeply creative friend who's home has always inspired me. I snapped some little glances to share here. I love this idea. 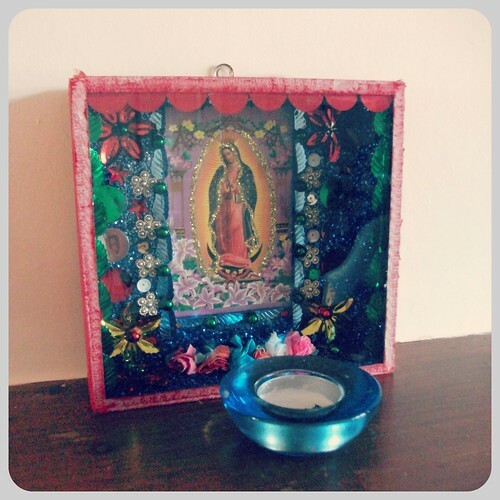 A three dimensional box covered in fabric, with a picture, lots of glitter and sparkly things, just what we need. Nice. 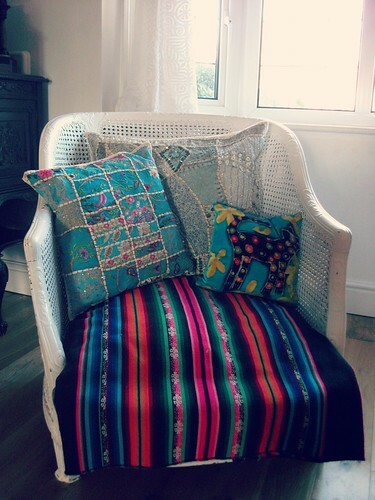 These two wicker chairs are gorgeous! Fabric from South America? I think. 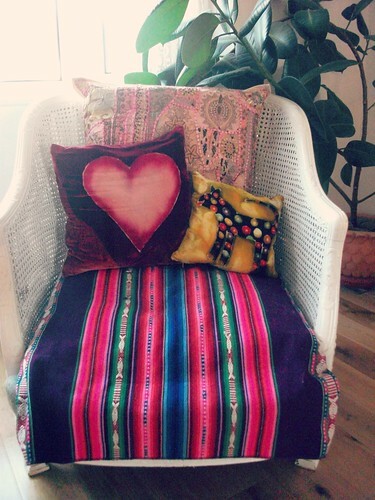 Cushions from India. A lovely heart. The cat cushions are fun. Real colourfull gorgeousness. Aren't they lovely. We have a next adventure planned. Meeting in London for the day. Exciting. So nice to have a partner in crime. Even if all we do now is drink tea and eat cake! and maybe check out an art gallery. Looking forward to it. Must make it happen! And how are you all? I'm sorry if I've been a bit disjointed here. I feel like I have been limping along here slightly, not quite keeping it together. If you have a conversation with me in real life at the moment it's the same thing. Slightly disjointed, wandering obliviously past people I know in the street. Feeling very sentimental really of late. Lots of random tears and then feeling quite together again. It's mixed bag right now! It has been a real pleasure reading about all the things you've done lately, about your bad dreams and your good friend!!!!! your findings are full of memories…..charming! thanks Joy. The little hexi quilt is very small, about pillow size. I brought it from a craft fair, I couldn't believe the amount of work that had gone in to it! I use as pad for my sewing machine. Chocolate boxes...how perfectly English! I am completely in love with them. So many pretty things. I love putting things out to be looked at, not stashed away in drawers. Some people call it clutter, I call it beautiful. You can do this! I hope you have a fabulous week. wow such beautiful photos and I love that hexagon quilt! 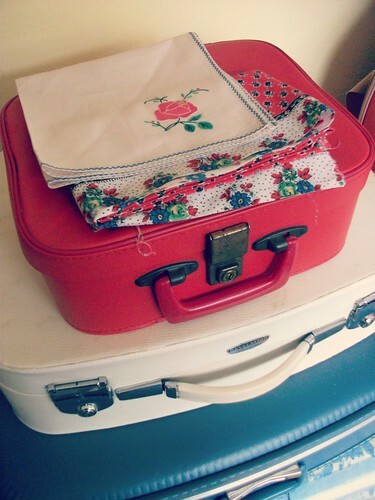 Thanks for this post, a real insight into life at the little Red Suitcase. Live all your rediscovered treasures. I had a little mouse as well, i kept ctachingnhim and releasing him next to the stream where he came from, but he kept coming back, until he suddenly disappeared . . . . .
A lovely post Heather, and hope you get everything sorted out soon. I think it's the time of year, we all seem to be having a bit of a tittivate! Take care with the 'mixed bag'! 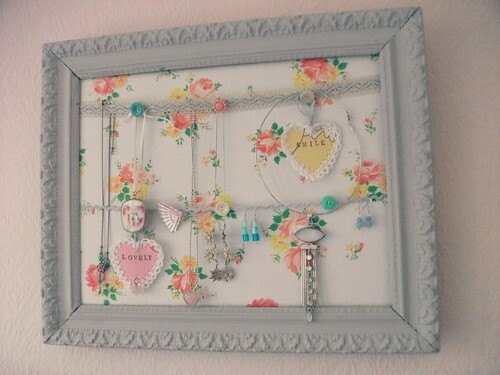 your jewelry board is amazingly imaginative...It is lovely to see things on display....gorgeous. I hope you have a quiet night tonight with lovely worry free dreams? What about a bunch of daffs to add a pop of color to the mantel? 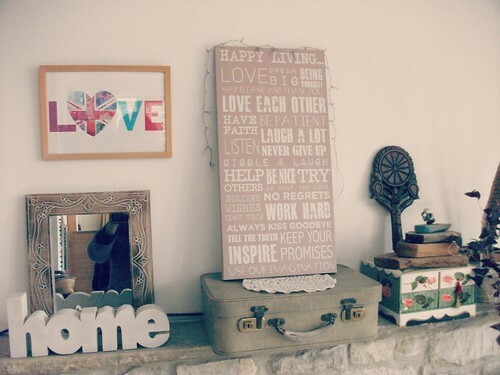 What delightful little corners of beauty you've created in your home. 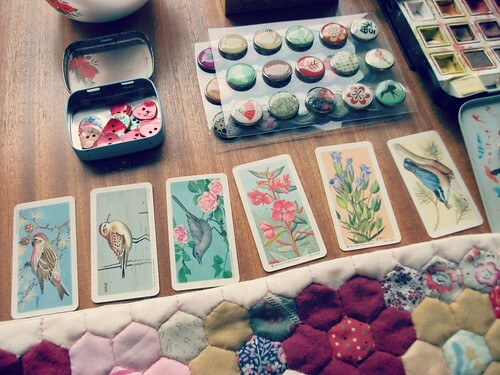 You have such an eye for detail, and you are a magpie, all those boxes and piles of colour and glitter! I hope you have some pleasant dreams too! I only every remember the nightmares and they are always terrifying sadly.